From the back cover: "Windsor Armstrong has a problem: her brilliant boy, Pushkin X, has become a football superstar and is planning to marry a Russian lap dancer. In Windsor's opinion, Pushkin is throwing away every good thing she has given him. When she was an unwed teen mother, Windsor attended Harvard, leaving her shady Detroit roots behind. She raised her son to be fiercely intelligent, well-spoken, and proud. Now he lives for pro football and a white woman of no account. 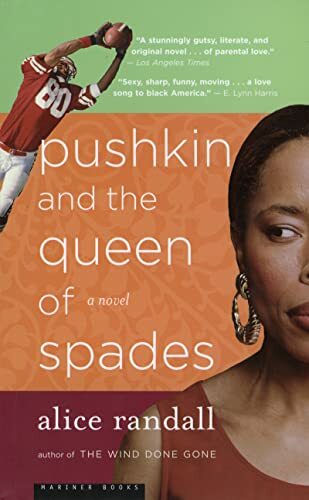 Outraged by her son's decisions but devoted to loving him right, Windsor prepares to give up her last secret: the identity of Pushkin's father." This was quite a book! It explores the complicated theme of race and its consequences and impact on people and their lives in the US. Windsor probes into her own life history while coming to terms with her son''s soon to be marriage. She comes to realize that it is love that matters wherever it is found. Releasing this book to a friend for week #30(jewellry-earing on front cover) of the Never Judge a Book By its Cover release challenge. Friend returned it to me to release. Released at the Vancouver Bookcrossing meet-up tonight. Enjoy! Looking forward to reading this. Thanks loveamystery! Agree - a great read! Looking forward to reading Alice Randall's other books. Lots of cultural references to think about here. Interesting book, I didn't like Windsor very much when I first met her. I thought she was a bigot, a snob, and way, way too judgmental. The more I read of her story and her background the more I softened towards her, at the same time she softens towards Tanya her beloved son's fiancee. Bringing to bookcrossing Meetup at the Rhizome. Come meet us, bring a book, take some books and have a damn fine cup of coffee.